It does not matter how big or small your business is; you will need a coin sorter at some point. Not only will a coin sorter save your valuable time, it will also make coin counting, sorting and wrapping less demanding and more accurate (Source). Just to ensure that you buy the right product for this type of work, there are several things that you need to put onto consideration. For instance, you need to get the unit with the right speed and hopper capacity for your business. Additionally, you also need to worry about the type of coins the unit can sort as well as its capabilities. Other than that, you can choose the unit with the features you personally desire, such as an LCD display. To help you make the right choice, here are reviews of five of the best coin sorters available today. 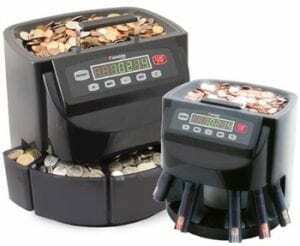 If you are looking for a machine that will take care of all your coin handling needs, then you should go for the best. 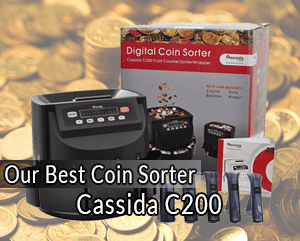 The Cassida C200 is one of the best all-in-one coin handling machines available today. In this regard, the machine is specifically designed to make your coin sorting, counting and rolling a lot easier. The Cassida is packed with an array of features to make all these tasks fast and more convenient. To make the product more efficient at the various tasks, it is equipped with several modes. For instance, the count mode of the unit is aimed at calculating the value of coins whilst separating them into different denominations. The Batch mode, on the other hand, will help you set the coin batches into different roll amounts. Depending on your preferences, you can customize the various batch amounts sorted by your machine between 1 and 500. In this mode, the unit will stop automatically once the preset batch amount is reached and then notify you. You will also find the ADD mode on this product rather helpful. This mode allows you to keep a running tally of the sorted coins. Simply put, this mode will give you a grand total of all the counted coins in the various denominations. This coin sorter is equipped with a bright, interactive LED display, making it even easier to use and interpret. You will also love the fact that the unit is fast and rather quiet in operation. If you are looking forward to saving some money on your purchase, you may need to go manual. Manual coin sorters are not outdated, yet. As a matter of fact some of them, such as the Royal Sovereign QS-1, are some of the most renowned sorters today. The QS-1 is a preferred product for many people today for a reason. Rather than running on batteries or electricity, this product needs to be operated manually. In this regard, it features an easy to use manual hand crank. Once you have loaded the coins into the hopper, you need to turn this crank for the unit to sort the coins and dispense them into wrappers. Well, this should be easier than physically sorting and counting each and every coin, right? Although some users may not like the fact that it is a manual machine, you will definitely love the fact that it is relatively affordable. Again, the sorting machine can work on different coin types, including pennies, nickels, dimes and quarters. The simple design of this product makes it comparatively lightweight. Additionally, the front compartment of the product may be closed for easier transportation and storage. Therefore, you will find it easier to move from one point to another. You will also find the product relatively easy to use. In this regard, it has clear labels as to where respective coin tubes and wrappers should be placed. If you are looking for a coin sorter for use at home or in a small shop, the Mag-Nif Digital Coin Sorter will do. 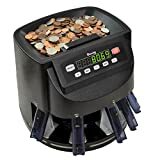 Regardless of how you look at it, this is a great coin sorting machine if you do not need to sort a large number of coins. In this regard, it has a hopper capacity of 50 coins only. With this motor-operated coin sorter, you will find it easier to sort smaller volumes of coins easier at home or in a small business. Being an electric model, this sorter comes with an AC adapter that plugs into an external power supply. Despite its low hopper capacity, you will find this product precise and accurate at what it does. The internal sorting mechanism used in this unit has been to be very effective and accurate in the long run. The compact and lightweight design of the sorter makes it more portable. If you own a large business, you probably are having a hard time sorting, counting and wrapping the coins every day. If so, you need a machine that was specifically built to do just that and is hands-free. With such considerations in mind, few products can beat the features and capabilities of the FS-144P sorting machine by Royal Sovereign. Not only is this unit manufactured by one of the most renowned manufacturers in the industry, it has all the features you need. To begin with, the hopper in this machine can hold up to 800 coins at once and can sort 312 coins per minute. The unit features an Automatic Row Advancement, which allows for a hands-free operation. Thanks to the interactive front panel display, you will find coin sorting, counting and wrapping very easy with this machine. 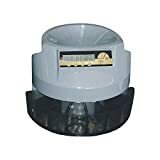 To ensure that you get the best value for money, it is advisable to buy a coin sorting machine that is a bit versatile. While all the available coin sorters will help you sort coins, a few units can do a little more than just sorting the coins. The Pyle Automatic Coin Sorter, for instance, makes coin batch counting easier as well. The 2-in-1 capability of this unit makes it a favorite choice for business owners across the world. In addition to its automated versatility, the product can work on any U.S coin currency. 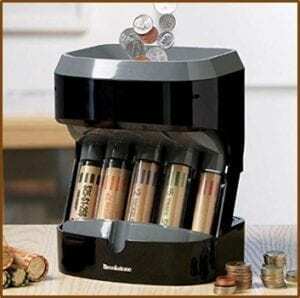 The product is primarily designed to sort coins in accordance to their variety. The counting mode of the unit will give you both the batch count and the free count of the sorted coins. Another aspect that makes this product more appealing is its LCD display. With this sorter at your disposal, you will be able to count and sort up to 216 coins every minute. Do you own a small or large business? If you already understand how the process of counting and sorting coins can be. This gets even worse when you have to count coins every time a customer buys from your shop and you have to give him or her some balance in coins. Owing to various technological advancements, you do not need to count and sort your coins manually anymore. To save yourself from the stress associated with this process, you should consider buying one of the best coin sorters available today. However, choosing the right sorter for whichever application is not easy either. How fast is your preferred unit at counting and sorting coins of different denominations? The right speed, in this case, will mainly depend on the number of coins you handle. Again, you also need to consider how fast you would like to accomplish the task. Like most of the users out there, you probably do not have all the time in the world to count and sort your coins. This being the case, you will definitely need a fast machine. This is particularly important in commercial applications of the product. In such a scenario, a faster counting speed will be more important than the hopper capacity of the sorter. This speed is often expressed in coins per minute. The higher the value, the faster the product is at sorting and counting. This refers to the maximum number of coins the machine can hold at one time. With a larger capacity hopper, you will not have to refill the machine every now and then, right? But again, you also need to get a machine that is best suited for the intendent application. Machines with a relatively large hopper capacity are considered to be more convenient. However, such products are also costlier than the ones with smaller hopper capacities. If you are working on a limited budget, you may need to settle for a unit with a comparatively lower capacity. For commercial applications, it is advisable to get a sorter that is fast enough and can hold a large number of coins. Yes, you read that right; not all the available coin sorters can handle all types of coins. Prior to purchasing one, you need to know the type of coins it can actually handle. The right choice, in such a case, will depend on the types of coins you regularly need to sort. Some of the high-end units available today are capable of sorting all coin types, including dimes, nickels, quarters and dollar coins. If you go for the cheaper products, you may have to sacrifice this capability. Therefore, it is important for you to ascertain the coin denominations your preferred unit can sort before buying it. Most coin sorting machine available today will let you know the number of coins for each of the denominations sorted. The problem with such a machine is that you then have to work out the total value of the coins on your own. For added convenience and accuracy, you should get a machine that will work out the total value of the coins as well. Some of the best coin sorting machines available today will actually let you know the value of coins counted for each of the coin denominations sorted. This is another tedious process you must be looking forward to eliminating in your business, right? To make the process easier, some of the units in the market are equipped with wrapper tubes. In addition to having specially-sized coin tubes, some have tubes that may be pre-loaded with coin roll paper. Such features will make coin wrapping easier for you, don’t you think? With regards to coin wrap tube trays, there are certain aspects that you need to consider. For instance, you should get a unit that offers automatic shutoffs as well as automatic advancing. Again, you also need to consider the number of tubes the model has. As you may be aware, some electric coin sorters are known to jam from time to time. This can be very frustrating and inconveniencing for your business. To avoid this inconvenience, it is advisable to buy a coin sorter that has the right anti-jam features. Such units are guaranteed to run for a long time without jamming. Such a unit will be ideal for an uninterrupted coin sorting experience. If you are currently shopping for the right coin sorting machine for use at home or in your business, you need to be a bit careful. Depending on the intended application of the product, you should purchase one that is fast enough. Additionally, you should choose a sorter with the holding capacity you find ideal. Such machines are meant to make the sorting and counting of coins easier and more convenient. As such, a little versatility of the machines will go a long way. Regardless of your preferences, this guide will help you choose the best coin sorter in the market. Also, check out our guides for Counterfeit Money Detectors and Best Gun Safes out there!